The Senior Adults Mission Trip to Jenkins, Kentucky will be April 24 thru April 29. We'd love to have you travel with us and be blessed by the Diaper Ministry in Appalachia. The team will take diapers and baby clothes. 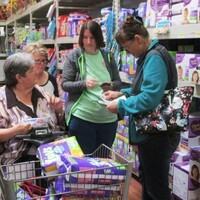 Cash is always welcomed to buy diapers and supplies for the mission house. The cost of the trip is $300 for double occupancy at the motel, and is due in the WNBA office by April 15. All checks can be made to WNBA and flagged for missions.